Including: Jasper Johns, Summer Critic (ULAE 40); Shusaku Arakawa, Still Life; Jean Tinguely, Untitled drawing; and Shuzo Takiguchi, Rrose Sélavy in Wilson-Lincoln System and Marcel Self-Portrait in Profile. The complete set of five works including three screenprints in colors, a lenticular panel and one screenprint on colored acetate set into embossed and die-cut paper, the full sheets and with full margins, with the accompanying book Selected Words of Marcel Duchamp (Japanese version), all contained in the original black linen-covered portfolio and cardboard box. 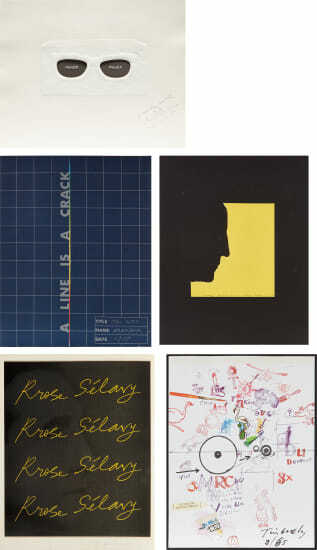 All signed and four dated in black ink, silver ink, ball-point pen or pencil, Rrose Sélavy in Wilson-Lincoln System signed by Duchamp, one inscribed 'Marcel dechiravit pour Shuzo Takiguchi 1967' in black ball-point pen, three numbered 9/60, IX/X and 9/65 respectively, published by Shuzo Takiguchi, Tokyo.